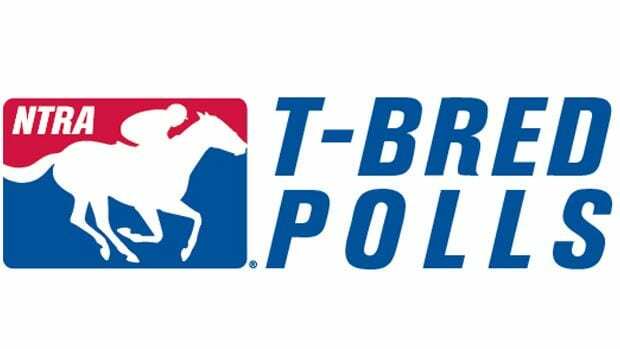 The addition of Fasig-Tipton Holy Bull Stakes winner Harvey Wallbanger into the tenth position was the only change in this week’s National Thoroughbred Racing Association (NTRA) Top 3-Year-Old Poll. Champion Game Winner (28 first-place votes, 296 points) and stablemate Improbable (1 first-place vote, 235 points) remain in the 1-2 spots, respectively, with War of Will (209) third in advance of his expected run in Saturday’s Grade 2 Risen Star Stakes at Fair Grounds. Mucho Gusto, stablemate to Game Winner and Improbable, is fourth with a single first-place vote and 179 points. Instagrand (126 points) sits fifth followed by Hidden Scroll (99), Signalman (77), Gunmetal Gray (69), and Tax (51). Following an off-the-board effort during his seasonal bow in the Sam F. Davis Stakes, Grade 1 winner Knicks Go was dropped from the top 10 in favor of the Ken McPeek-trained Harvey Wallbanger, who garnered one first-place vote and 49 points. The status quo held in the NTRA Top Thoroughbred Poll with no change in that top 10. City of Light, winner of the $9 million Pegasus World Cup Invitational, remained in the top poll position with 27 first-place votes and 279 points with champions Monomoy Girl (4 first-place votes, 217 points) and Roy H (200 points) second and third, respectively. Battle of Midway is fourth with 178 points. Rounding out the top 10 are: Bricks and Mortar in fifth (149 points), Accelerate (143), McKinzie (119), Seeking the Soul (112), Sistercharlie (61) and Game Winner (46).